It’s an awkward feeling when you haven’t been invited to the hottest ticket event of the year. Nobody likes missing out, and no-one likes being an after-thought invite. To avoid such disappointment, consider yourself personally invited to the biggest coffee dedicated event of the year – MICE, taking place from 7 to 9 February, 2019. Are you excited? You should be. This is a once-a-year opportunity to celebrate the Australian coffee industry, your industry. The front façade of the expo is ready for Instragramming, the competition stage is in the works, exhibitor stands are being built, company representatives are practicing their best spruiking techniques, and baristas are perfecting their best brewing techniques. All that’s left to do is book your ticket online (to avoid queues), and roll up. Don’t be “that person” who assumes they know all the details after seven years visiting the Melbourne International Coffee Expo (MICE) and rocks up to the Melbourne Showgrounds’ Grand Pavilion, or worse, in a different month. Hold up. For the first time, MICE is taking place at Melbourne Convention and Exhibition Centre (MCEC), Australia’s largest convention and exhibition space at 70,000 square metres. MCEC has been used as Melbourne’s premium event space, hosting everything from the Melbourne Symphony Orchestra, annual Good Friday Appeal, ballet, travel expos, PaxAus, international conferences, and even Hillary Rodham Clinton in her latest Australian tour. Think city central location, and a plethora of restaurants and not-to-be-missed cafés in close proximity to the expo. Hello after-expo beverage. Hello fine-dining options. Hello work tax receipts. From the very beginning in 2012, MICE was created as Australia’s first and only coffee-dedicated trade show to connect buyers and sellers, and bring industry members together in the one space. With time, MICE has evolved into an important part of the Australian and world coffee community fabric. 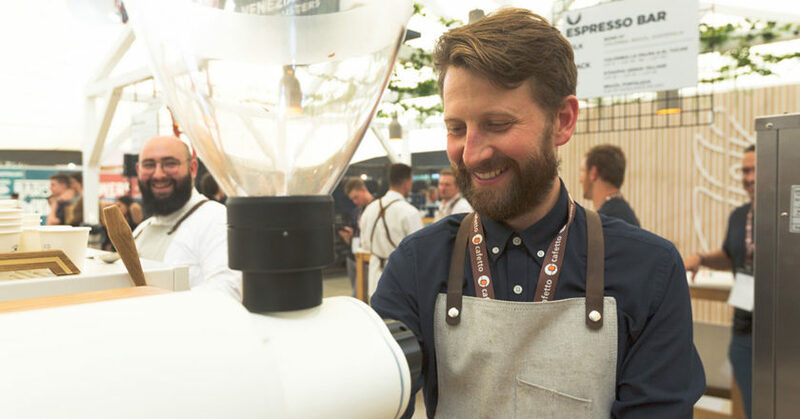 MICE is an annual family reunion to connect industry members from across the country and around the world, including producers, coffee importers, espresso equipment and brewing manufacturers, coffee roasters, roasting equipment manufacturers, and baristas. And connect it does. MICE2018 saw an attendee increase of 14.5 per cent on the year prior with 11,043 visitors from 39 countries including Burundi, Cambodia, Chile, China, Colombia, France, Great Britain, India, Laos, Myanmar, the Netherlands, New Caledonia, Peru, Russia, South Africa, and United Arab Emirates. Registration data tell us that the top reasons for people attending MICE are to look for new products, equipment, and technology, see existing suppliers, source new suppliers, taste different coffee, watch the coffee championships, and compare products. To date, MICE2019 will feature more than 23 roasters, 25 different machine, roaster and equipment manufacturers, 14 dairy and dairy alternative brands, and 15 green bean representatives. A barista competition you say? MICE doesn’t host just any barista competition. Think grandstands, custom-made stage, clock countdowns, music, emcees, big screens, judges, baristas, and flashing cameras. The Australian Specialty Coffee Association (ASCA) Australian Coffee Championships are the pinnacle of barista talent, the ultimate showdown, the pièce de résistance, and the one event you want to win to ensure guaranteed bragging rights for an entire year. Experience what coffee competitions are all about. Not only is there the coveted Pura and Dairy Farmers Barista Championship, but the Latte Art Championship, Brewers Cup, TCX Cup Tasters Championship, and and AMC Roasting Championship. The best of the best baristas in each category have been training months, if not years for their moment in the spotlight and the chance to represent Australia on the world stage. The pressure is high and nerves are aplenty, but the one thing they need is your support. With the #ASCAtop12 placings announced, choose your favourite barista to cheer on at the event. Wear branded t-shirts, hats, banners, signs, and flags. We’re not joking. Do it. Make sure your phone is in tiptop working order. Enough memory space? Room for a few hundred photos? You’d hate to be in that awkward position when you’ve just spotted 2015 World Barista Champion Sasa Sestic, he’s agreed to a selfie, and the dreaded message “your memory is full” appears on your phone. Take all precautions. There will be some recharge stations to give your phone an extra boost, but personal rechargers are encouraged. Charge your photo and get ready to snap and share your best pics Instagram pics to @melbournecoffeeexpo. @internationalcoffeeexpo and #MICE2019 so we can follow the fun with you. Instagramming tip: there will be plenty of photo wall opportunities to capture the perfect pic. Preparing for MICE is not unlike preparing for a 14-course degustation at Melbourne’s fine-dining institution Vue de Monde. If you’ve decided to indulge in a big breakfast with all the trimmings and back it up with a few frothies, pies, and sandwiches for lunch, you’ll be struggling to make it past the fourth course. Our advice for MICE: skip your first coffee of the day at your local café, or at home, and make it a memorable one at MICE. Not only are all the coffee tastings free (yes, it’s included in your ticket price) but you can partake in all the coffee cuppings, samples, slurps, and swallows your taste buds can handle in every brew method imaginable from more than 10 different origins. Visit Roasters and Origin Alley, partake in a cupping room session, and try the brand new espresso bar for a traditional sample of what Melbourne’s coffee culture started with – espresso. As much as you can circle MCEC living off free coffee samples, soy drinks, milk creations, and the odd complementing bikkie, there will come a time you want to take a bag of delicious coffee home from a new discovery you “just have to have”. We recommend a bit of extra cash or a card on hand for those indulging moments. Then there’s food to consider. As the show’s official Providore Sponsor, ST. ALi will ensure its food experience is the best in town with Head Chef David Dobra whipping up some delectable menu items to mirror any of Melbourne’s top dining experiences. Say goodbye to average expo food and hello to a mouthwatering food experience to rejuvenate your taste buds for an afternoon of coffee drinking. MICE2019 is in the home straight until the doors open 10am on 7 February. With 95 per cent of the floor space sold, excitement building from exhibitors and attendees, all that’s left to do is secure your ticket and start the countdown. For more information on MICE2019 or to exhibit, contact MICE organisers at event.organiser@primecreative.com.au or +61 3 9690 8766.